Hey there. Like most men, I have a morning ritual. I get up, get dressed, brush my teeth, comb my hair, and then I shave. That shaving one is optional. I can go a few mornings without shaving and it's mainly because I don't want to take the time to get everything I need for the best possible shave. And other times, I don't need a full one shave. I need to touch up on some rouge strands of hair in my 'stache or goatee. I want to look my best at the office but sometimes I just don't have the time in the mornings. 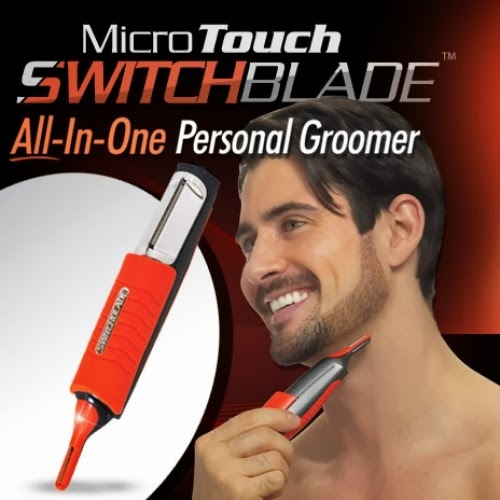 Enter the MicroTouch SwitchBlade All in One Groomer. Our good friends at Ideavillage and FuelMyBlog provided me with this great grooming tool to try out and review and let me tell you... this groomer is absolutely perfect for touch ups. Before I get into my experience with the MicroTouch SwitchBlade, let's get into some product details. The MicroTouch SwitchBlade is a battery powered head to toe groomer. This 6 piece set includes 4 attachments. 2 for longer hair and 2 for short hair. It has 2 trimming edges, one for full size trimming and a one for micro trimming. The full size trimming blade is great for chest, back, arms, legs, and getting that haircut that you've been putting off. The micro trimming blade is perfect for those hairy areas that need more precision trimming. It's great for your nose, ears, eyebrows, neckline, side burns, mustache, goatee, beard, and just about anywhere else you want trimming. The MicroTouch SwitchBlade is made with German stainless steel blades so you never have to worry about maintenance and it also includes a built in LED light to aid in your trimming. Now, let's go on with my experience. First off, the MicroTouch SwitchBlades requires 2 AAA batteries. I'll admit, I wasn't too happy about that. I'm used to having my grooming tools battery free so it was a bit of a turn off that I had to get batteries for the groomer. 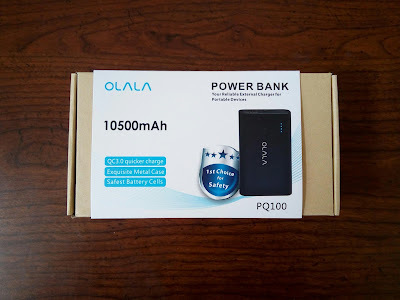 The batteries are quick and easy to install and they were in, I was good to go. I usually sport a goatee and a full mustache and those are the areas that I focued on trimming. I attached the smaller micro attachment to the micro trimming edge and got to work. The attachement easily snapped into place and trimming my mustache took no more than a minute. Awesome. I removed the attachment and trimmed a clean outline around my goatee. Again, quick and easy. No hassles, no tugging, just a clean trim. And the LED light is pleasure to have. Sometimes while shaving and trimming, my arm's shadow will get in the way, dimming the area that I am grooming. The built in LED light elimnates any shadows so you will always get a clear view of what you are trimming. You can slide the orange piece on the body to cover the full sized trimming blade (shown). Just for my curiousity, I pulled back on the handle and decided to give the full trimming edge a try. I didn't need a hair cut and I didn't wan't to shave my legs or arms so I decided to test it out on my chest. I didn't use any attachments (I'm not THAT hairy, guys!!! lol) and got to work. The same results as the micro trimming edge. Quick, easy, and NO SCRATCHES! Because I was placing the trimming edge on more skin surface area, I was expecting the trimming edge to leave a scratches. I tried using an electric trimmer on my chest a while back and it left my chest looking like it went into battle against a cat! To my pleasant surprise, the MicroTouch SwitchBlade All in One groomer is extremely gentle on the skin. Even though I wasn't too happy about having to buy batteries for the MicroTouch SwitchBlade All in One groomer, I am extremely happy with how well it performs. I figure that because it does such a great job at triming, it won't be on for too long so the batteries will last awhile. I do fear that I will be caught trimming when the batteries do decide to die and the groomer will tug at my hair. But that can be avoided by switching the batteries regularly. I've found myself using this groomer everymorning for that quick touchup and it compliments my full blown shave in the evenings very well. Even if you don't have the time to do trim up at home, you can easily have the MicroTouch SwitchBlade stashed in your desk at work and sneak away for a minute to groom up before having to step into your boss' office or step into that meeting. It's important to look your best and with this great product, time will never be an issue! Interested in picking up one of these bad boys? You can get more info and pick one up for yourself here! Later!